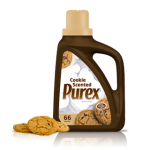 DnBuster's Place: New Purex Product~ Chocolate Chip Cookie Scented Laundry Detergent! New Purex Product~ Chocolate Chip Cookie Scented Laundry Detergent! As a valued member of Purex Insiders I get to introduce my readers to Great new products on the market!! This is now my familys favorite detergent! Everyone loves cookies, they’re delicious! The smell of this detergent will make you want some cookies! Cookie Scented Laundry detergent leaves our clothes soft and with a Fresh Cookie Scent. disclosure~ we would like to emphasize that in no way should it be suggested or implied that Purex Laundry detergent has anything to do with baking or cooking. Purex Laundry Detergent is not for consumption.